Fear of pain is one reason a patient may be apprehensive about a medical procedure. The most common form of pain control, namely local anesthesia, can itself produce anxiety. A variety of techniques are used to overcome this discomfort. These include alteration of factors related to the injected solution such as pH and temperature, a reduced speed of injection, and topical anesthesia. 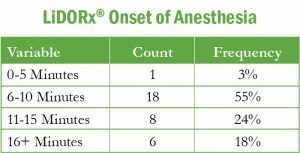 LiDORx® is a topical anesthesia that relies on the pharmacologic effect of anesthetics when applied to surface tissue. LiDORx® releases Lidocaine Hydrochloride USP from a mild acidic vehicle to stabilize the neuronal membrane by inhibiting the ionic fluxes required for initiation and conduction of impulses, thereby effecting local anesthetic action. A mild acidic vehicle lowers pH to increase protection against alkaline irritations and to provide a favorable environment for healing. Research demonstrates that lidocaine, used as a single agent, is effective at concentrations between 5% and 20%. Since LiDORx® is a 3% solution we lack information regarding the onset of action. 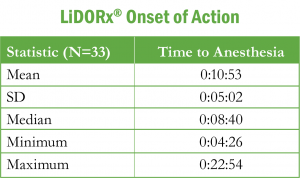 Current information suggests that the onset of action for LiDORx® is 3-5 minutes; however, this has not been verified. Given the wide variation in dose response for lidocaine, it is important for us to understand the onset of action for LiDORx®. Gender – there was no gender-based enrollment restriction. Therefore, subjects of both genders were included in the research unless there were appropriate medical or scientific reasons. Pregnant and nursing women were not be included in the study. Age – there was no adult-based enrollment restriction, patients aged 18– 88 were included in the research unless there were appropriate medical or scientific reasons for their exclusion. Race/Ethnicity – there was no racial-based enrollment restriction, patients of all ethnicities were included in the research unless there were appropriate medical or scientific reasons. In the winter of 2014 a convenience sample of 37 subjects participated in the study. After informed consent was obtained, subjects were seated, given LiDORx® (generic packaging for blinding purposes), and a short monofilament line. A co-investigator applied the LiDORx® (according to the product directions) to the top of the subject’s non-dominant hand. Once applied, a timing device recorded the length of time to anesthesia. Time to anesthesia was articulated by the patient as yes or no through the use of the monofilament line. The subject gently poked his/her medicated hand with the monofilament line. 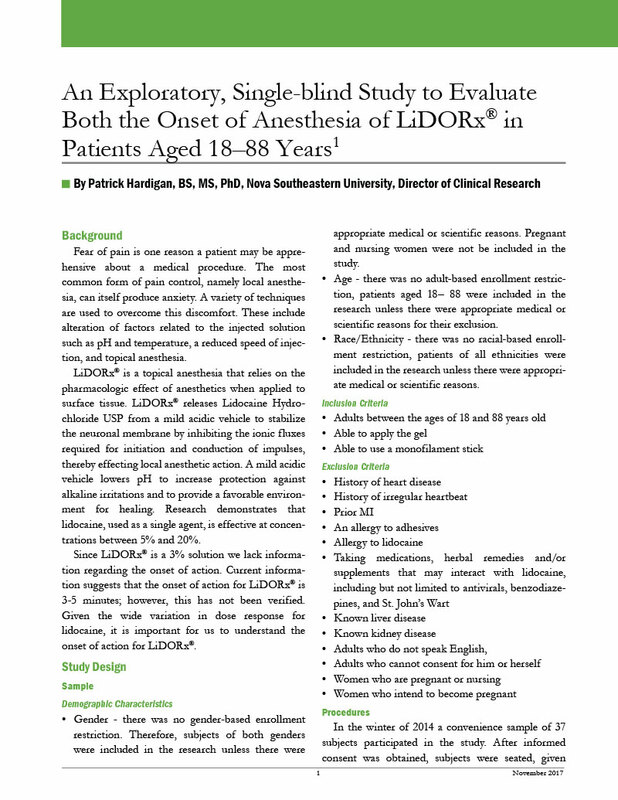 Thirty-seven individuals participated in the LiDORx® study. Four patients were removed because (a) subjects never experienced the onset of anesthesia and/or (b) subjects required multiple dosages. The average age was 44.38 (± 15.90) [minimum age = 20 and maximum age = 72], 62% were female, and no adverse events were reported. The median time to anesthesia was 8 minutes and 40 seconds. Over 55% of the subjects experienced anesthesia within 6 to 10 minutes. 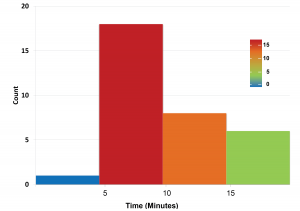 While the median time (10:53) to anesthesia exceeded the three-to-five minutes currently suggested for the 3% solution, the majority of patients experienced anesthesia within six to ten minutes. In conclusion, this study provides evidence of drug efficacy with no reported side effects.